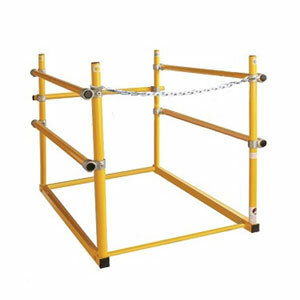 OSHA Grade Roof Hatch Safety Railing System, Fits 30 in. x 54 in. (inside opening) Stair/Ship Roof Hatches. Clamp on System is Easy to Install and Non-Penetrating. Railing is open on the 30 inch side. Yellow Powder Coat Finish. Price/Each. (aka SHWC-5430; shipping leadtime 1-3 days). Easy clamp-on design. No penetrations needed. 1-5/8" OD, A53 grade galvanized steel structural tubing frame. 7 year manufacturers warranty against all defects in welded components and against rusting or any deterioration from weather related reasons. Layout: Available with long or short side opening.